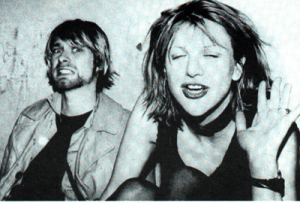 This is a fascinating article on Kurt and Courtney. True confession time: My character Howard, aka Declan Decker (When Lyric Met Limerick), was loosely based on Kurt Cobain. However, Luna, his lady love, was definitely no Courtney Love. The two-decade long question of whether or not Kurt Cobain really committed suicide came up between myself and my friend today. It’s been bandied about for years, but it seems no one has ever bothered to take it seriously or re-open the case to further investigate Cobain’s death. Even though Kurt may have been prone to depressions and shied away from the stardom he achieved as both an early pioneer of the Grunge movement and The Poster Child of Generation X, I never believed he really killed himself. Why would he? He had everything–talent, success as the frontman of Nirvana, a bestselling record, a baby daughter, and a…ahem…new wife who everyone believed was in love with him.